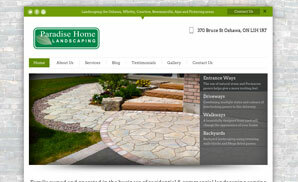 Paradise Home Landscaping’s mission is to provide professional landscape services with nothing short of complete customer satisfaction at competitive prices. It is a design and build company that will tailor to each customer’s individual home landscaping needs. It strongly believes that committing to one job at a time is very important in order to complete a landscaping job in a timely manner. Its great customer service has driven the business to be mainly referral based. The project was a website redesign from a static website to a responsive design and its contents managed using WordPress.